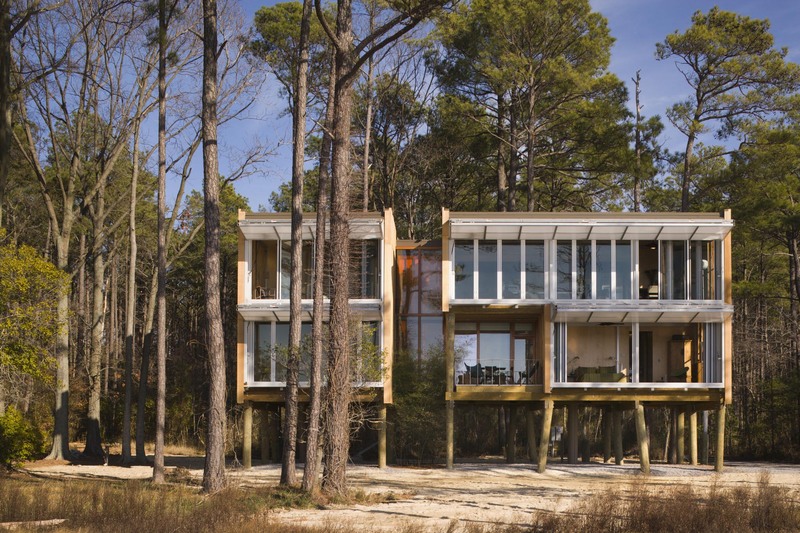 "Named for the tall pines that characterize its site on the chesapeake bay pines that characterize its site on the Chesapeake Bay," says design firm Kieran Timberlake of Loblolly House, "this 2,200 square-foot single family residence seeks to deeply fuse the natural elements of this barrier island to architectural form." 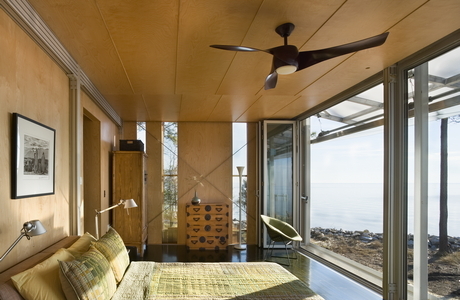 Loblolly is also a forward-thinking experiment in prefabricated residential architecture. With this goal in mind, the designers were looking not only for a home that suits its sylvan surroundings, but one with repeatable results. NanaWall's engineering and manufacture turned out to be particularly apt for meeting these goals. 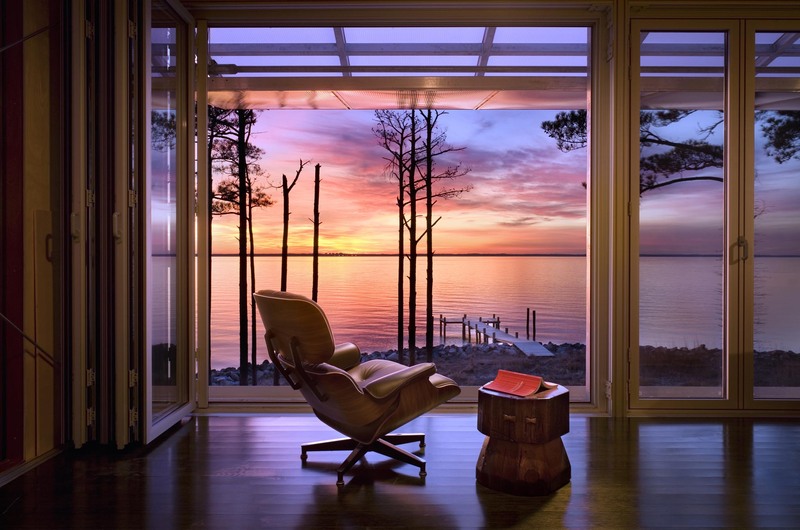 "The project goals," relates Carin Whitney, Kieran Timberlake's communications director, "included providing savannah-like views of the Chesapeake Bay and opening the interior fully for natural ventilation, and to give it a porch-like feel. The plan also called for trapping the radiant heat that forms in the cavity between layers, to provide thermal insulation when the exterior acrylic doors are in the closed position. 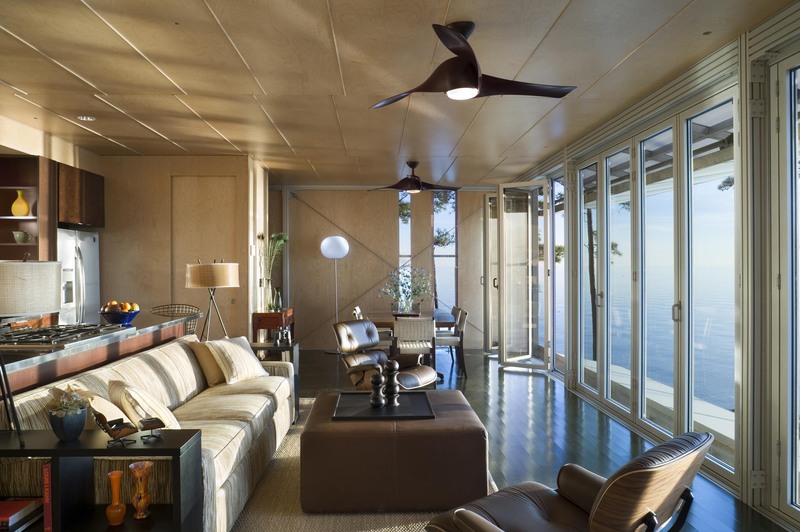 "Nanawall turned out to be the most appropriate system for Loblolly House in large part because of the system's compatibility of jamb and sill details with the aluminum structural frame." 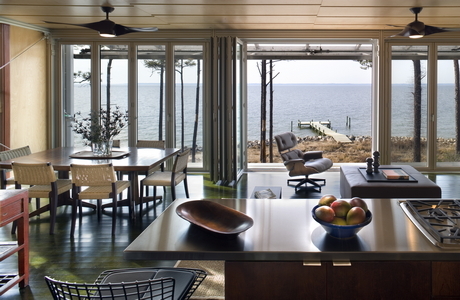 While some systems could offer the views or the needed thermal performance, NanaWall was able to provide both of these desired outcomes as well as offering a variety of folding configurations, which allowed the designer to specify a custom glass door system tailor-fit to suit the client and the structure. The completed Loblolly incorporated two 4-panel inswing installations of NanaWall's SL70 Thermally Broken Aluminum Framed Folding System. When open, the NanaWall SL70 panels "effectively transform the interior of the house into a porch," remarks Marilia Rodrigues, an associate and project architect at Kieran Timberlake. Occupants can enjoy a practically unobstructed view through the west-facing wall overlooking the bay, from the comfort of the living room sofa. Plus, adds Rodrigues, "The system was ideal because it worked with the house's unique aluminum frame structure." The structure that Rodrigues refers to is part of Loblolly's forward-thinking, prefabricated design. The extruded aluminum structure, manufactured by Bosch Rexroth, is the kind more often associated with industrial applications or with temporary structures. Whitney recalls, "Nanawall turned out to be the most appropriate system for Loblolly House in large part because of the system's compatibility of jamb and sill details with the aluminum structural frame." 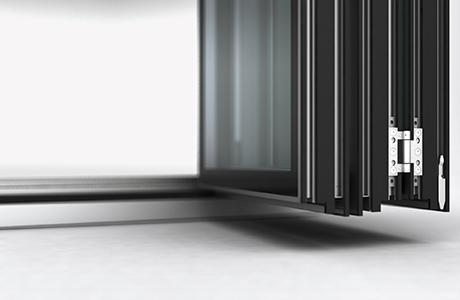 NanaWall's manufacturer support included the ability to build according to BIM details provided by the design team. The SL70's thermally broken design also met the team's criteria for retaining radiant heat. The system provides the needed insulation to make the project remarkably energy-efficient in the colder months. But of greatest value to the residents is the marriage of interior and exterior at any time of year. NanaWall's design provides monumental glass through which one can enjoy Loblolly's promise of "savannah-like views," even in winter. And in summer, the system's superior engineering and stainless steel tracks and runners ensure smooth operability. That provides residents the opportunity to easily enjoy the feel of a porch, and unobstructed bay views, in just a few seconds. "NanaWall allowed us to create uninterrupted views to the Chesapeake Bay," says Rodrigues. "The system was ideal for this project."